To keep their skills in top form, military surgeons need a sizeable and clinically complex caseload. That’s why “recapturing care”—encouraging TRICARE-eligible military personnel, families, and retirees within driving distance of a military treatment facility to seek care there first rather than at civilian medical facilities—is a strategic priority for the Defense Health Agency . Akoya recently wrapped up our engagement supporting a successful recapture pilot program at the Puget Sound Military Health System (MHS). Our integrated marketing campaign emphasized the superb care the system provides to patients and its unique strengths in serving the military community. 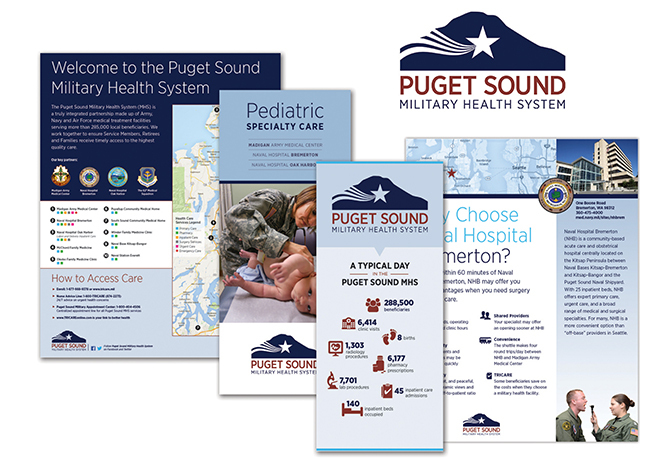 One of our challenges was creating a unifying brand for the consolidated Puget Sound MHS, which includes Army, Navy, and Air Force facilities that were traditionally operated independently. Another was supporting internal communications to convey the new business plan and processes that are driving high quality, effectiveness, and efficiency across the system. The new brand, along with a suite of patient-centric marketing tools, has raised the profile of the system as a preferred provider for TRICARE beneficiaries. Many thanks to our project lead, Carrie Petershagen, who has accepted a permanent position at the Puget Sound MHS starting next month to continue the good work! This entry was posted in News on November 1, 2017 by Amelia Williams.